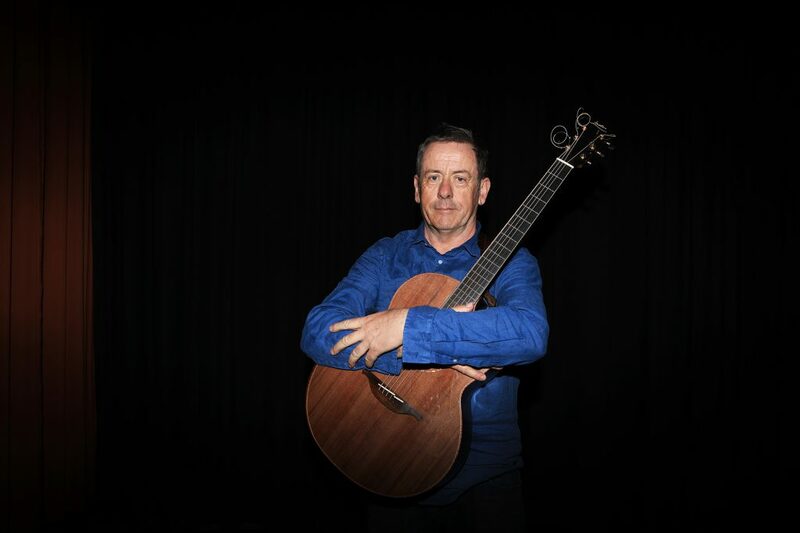 Luka Bloom’s agent in Switzerland told me that in all the Swiss German towns Luka performed in before coming to Geneva last Saturday his songs were met with polite applause but an uncomprehending silence greeted his stories about the songs. There is no doubting Luka’s amiable stage presence. He held the audience in the palm of his hand as he told the stories behind the songs or the reasons why he chose to do two Leonard Cohen covers, A Thousand Kisses Deep and My Secret Life in tribute to one of his great heroes. Between songs he talked like a man starved of conversation and had to keep reminding himself not to be talking so much and to get on with the songs. The rest of his set was familiar as was the beauty of his guitar playing. As I Waved Goodbye, City of Chicago, Sunny Sailor Boy, Exploring the Blue, Make You Feel My Love, Bogman, Black is the Colour and the touching ballad Thank You For Bringing Me Here, inspired by the daughter that Paul Hill, of the Guildford Four, thought he would never have. While sharing a pot of tea in Doolin, he told Luka that eight year old Saoirse came out with the line as he walked with her on the beach at Fanore watching the sun set over the Aran Islands. Luka draws inspiration from such incidents in his life. Probably his “greatest hit”, the City of Chicago, a standard for his older brother Christy Moore, was written in a 20 minute burst of melancholic inspiration after saying goodbye to his brother Andy who was heading for America, perhaps for good, in the years before mobile phones and cheap air travel. An unusual feature of his set was that he only performed the title track of his new album Frúgalisto, but a singer who has a catalogue of 22 albums can afford to pick and choose. 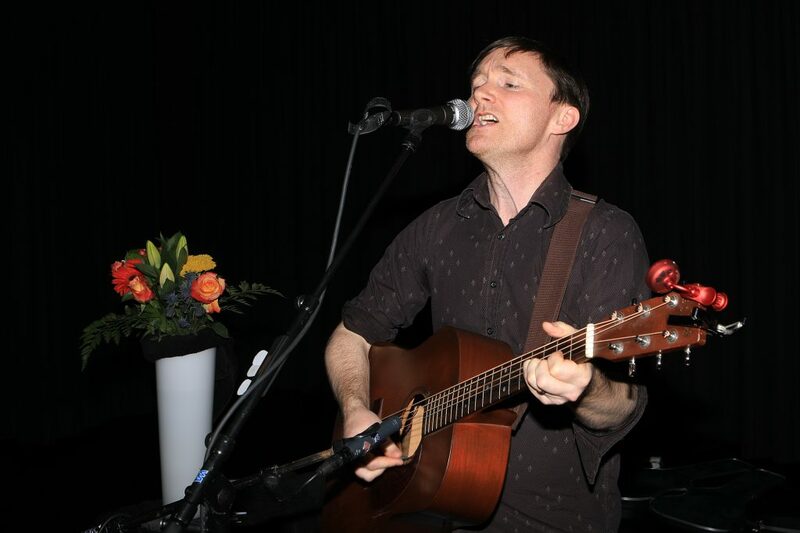 It was a charming evening kicked off by Eoghan O’Sullivan (below) a fine singer/guitarist from Greystones, a regular around Geneva night spots but performing his own songs for the first time to a GLAS audience. His short set won high praise from Luka as he came on. Check out his songs and stories. The evening closed with a standing ovation for Luka and CHF 7,000 raised for the Gaza School of Music, a branch of the Edward Said National Conservatory of Music. They do great work for musically talented children living in the deprivation of the world’s largest open air prison. A very worthy cause. Thanks as always to our anonymous main sponsor and to Charly O’Neill’s fine drinking and dining emporium for sponsoring the GLAS raffle. 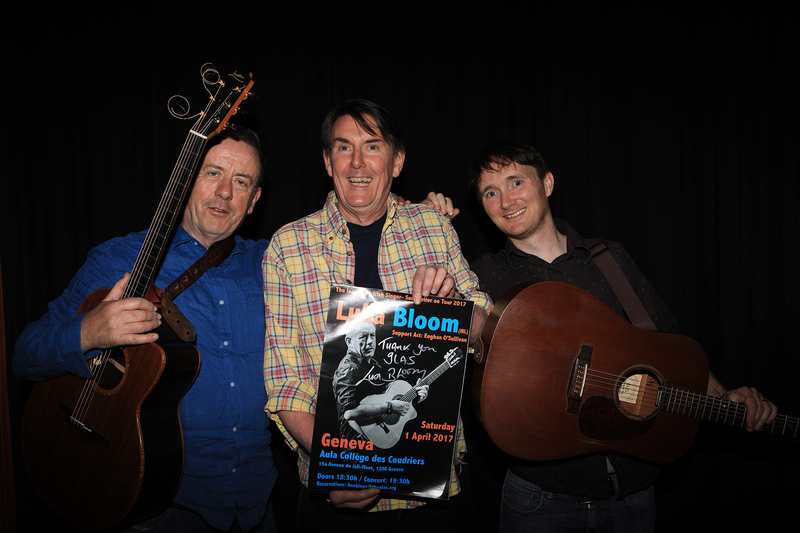 Luka Bloom, Denis McClean, Eoghan O’Sullivan, Collège des Coudriers, Geneva, 1 April 2017.